Alice Wilhoit retreat June 4th-7th. Seven meals, teacher, three days-$180. Applique, embroidery, crazy patchwork, piecing, ribbon embroidery. Any project-Alice will help you learn & create! UFO Retreat June 22nd-23rd. Five meals & three days $145. This is open to all. Grab a friend or your small group and come have a great time sewing up some of your stash! Jackie Brown Machine Quilting retreat July 13th-15th. Five meals, teacher, and three days-$180. Bring your domestic sewing machine or Handi-Quilter sit-down unit. Sarah Francis small block retreat July 27th-29th. Five meals, teacher, and three days-$175. Do you like ‘small’ blocks? Are you working on a ‘small’ block quilt? If you are working on or wanting to get started on such quilts as Dear Jane, Sylvia’s Bridal Sampler, Farmer’s Wife or Pony Express Sampler, or Nearly Insane, etc., then I encourage you to come join us at this “Small” block retreat where Sarah Francis, DJ guru, will help you with those small blocks. Blocks no larger than 6” please. See you there. Brenda Asmus Feathered or un-feathered Star retreat Aug. 17th-19th. Five meals, teacher, and three days-$165. What a beautiful project to make in a weekend. Don't need another project to start? Want to finish a Marti project that you have in your UFO stash? Brenda is one of Marti's right hand educators. She travels all over the U.S. with Marti. She can help you master Marti's products. She even teaches how to use templates with the Farmer's Wife quilt...This retreat is perfect for all that want fun-filled instruction using Marti Michell template sets! Eileen Urbanek Bali Bedrunner( by Judy Niemeyer) retreat Nov. 2nd-4th. Five meals, teacher, and three days--$200. Eileen is loved by avid retreaters as an awesome teacher of this method. See website for project pictures and more information. We hope you are enjoying our very nice spring. Summer is coming so start planning what retreat you want to attend and which classes you need to improve your skills. You will have fun getting out of the heat by sewing with other quilters indoors. 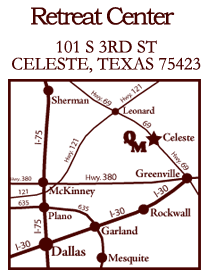 See our retreat list and classes! We are very excited to have the Handi Quilter truck coming to our store May 24th-26th!!! This means TRUCKLOAD sale! Spring Market is this weekend at Kansas City and then their truck is headed straight to our store after market. SOOO, have you been on the fence to buy one of these units? If you pre-buy one of the market demo machines, you can get the best pricing Handi Quilter allows. Free shipping is also a great advantage of this sale. Call today. Even if you wait and come see us during the event, great prices are the theme of the weekend. Already own a long-arm? Check out the long arm classes Nanc Christopherson will have during these three days. It does not matter what brand you own, her classes will help you improve your skills. She is a national educator for Handi Quilter that travels all over the US. Sign up quickly because space is very limited. She is also available for advanced classes. Let us know if you want a special list of these classes sent to you. Our ten year anniversary week will be May 29th-June 2nd. (This week is our celebration to share with all quilters instead of participating in the Patchwork Express Quilt Sampler bus tour.) We will have store drawings and these special sales: Tues-30% off Beanpod candles, Wed.-15% off notions, Thurs.-20% off factory precut fabric packs, Fri.-20% off Jim Shore items, & Sat.-30% off Robinson Anton Rayon threads! On Saturday June 2nd we will have a repeat of our very popular, “Teacher Meet & Greet.” All of our wonderful teachers will be on hand to show you a sampling of their talents and give you a chance to put a face with the names. Door prizes will be drawn hourly. Big prize for the week is a rolling sewing machine case (valued at $139.95)which will be drawn at 2:30 on Saturday June 2nd. Don’t worry about being here, we will hold the prize until you are able to come to pick it up! 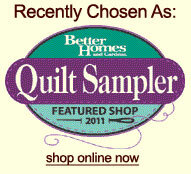 The spring issue of the Quilt Sampler magazine has just arrived. We have also just received “The Strip Stick” notion— a unique way to press your seams. One of our talented customers showed us this product during a retreat and we agree-it is very helpful. Many new samples are hanging throughout the store. Over 50 bolts of a new batik line “Over the Rainbow” by Moda is soon to arrive and there is more to follow. Thanks for your continued support and keep stitching..
Rulers Thurs. May 24th, 1-4. Let Nancy show you how to use multiple rulers when custom quilting. Using rulers to enhance your quilts will open a whole new area of expertise for your quilting. Hands on training will be done in class. Thread, needles, & tension Thurs. May 24th 6pm-9pm or Sat. 9am-12pm. All three of these are so important to your finished project but tension is the real tricky part. Let Nanc remove some of the mysteries of tension! She will also demonstrate loading your quilt onto the frame. Pro Stitcher Friday May 25th, 9:30-12:30 Pro Stitcher is such an awesome piece of equipment. Nanc will show you the ins and outs of how to use this great tool in completing those quality computerized quilts. Art-n-Stitch Friday May 25th, 2pm-5pm. This digitizing program can be used with any long machine that accepts flash drive patterns. Art-n-Stitch is also an embroidery digitizing software program. It is a well-supported program with online tutorials—come learn the basics. Machine Quilting Workshop (for domestic sewing machines or Handi Quilter sit-down units) Sat. May 26th, 12:30-3:30 for $25. Jackie will cover basics to increase your confidence level to quilt those projects for yourself. We will have a sit-down unit and two sewing machines for hands on training with demonstrated techniques. If you don’t have time for a retreat or would like to see if this option works for you—come join us. Level 1: Basic Pantograph Long Arm Quilting class Wed. May 30th, June 20th, July 18th, Aug. 8th, Aug. 29th, or Sept. 19th. 9:30-3:30 for $150. Learning to stitch a pantograph pattern on your quilt is an easy and fast way to make your quilt look like you had a professional quilted it. The basic steps will get you started on learning how to put a nice pantograph design on your quilt. Jackie will teach the six steps to get started becoming a confident long arm quilter. Level 2: Custom long arm quilting class Wed. May 16th, June 6th, June 27th, July 25th, Aug. 15th, or Sept. 5th, 9:30-3:30 for $200. Would you like to learn how to make your quilts stand out with some custom quilting? This class will teach you the basics of custom quilting. It’s fun and you can use your creative mind to enhance your quilt. You can say you quilted it and had fun doing it. Jackie will teach seven steps to get started becoming a custom long arm quilter. Level 3: Artistic Custom Quilting class Wed. May 23rd, June 13th, July 11th, Aug. 1st, Aug. 22nd, or Sept 12th, 9:30-3:30 for $250. After completing Level 1 and Level 2 classes you are now on your way to Artistic quilting. This class will take you to the level of a professional quilter, with lots of practice, patience and determination! You can make your quilts stand out in a crowd. Your family and friends will ask if you had a professional quilt it, and you can proudly say, “I quilted it”!! Jackie will teach the six steps to getting started to becoming a Artistic Long Arm Quilter. Wool Applique & Silk Embroidery Sat. June 16th, 10-4 for $40. Wool is fast becoming a favorite way of appliqué. In class you will learn techniques using wool, embroidery and silk ribbon as you construct a lovely basket block. Basic Hand Embroidery Wed. July 25th, 10-4 for $40. Spend a few hours with Alice and learn how to embroidery or to brush up on those stitches. This is a technique class. All you need to bring is scissors! Everything you need is furnished in a kit. She will also show you some products that make embroidery so much faster! You don’t want to miss these tips—–stop wasting time tracing those patterns. You will have a fun day of stitching. Applique Workshop Thursday July 19th, 10-4 for $40. This six hour technique workshop will take you from being afraid of the "A" (appliqué) word to all the confidence you need to make any appliqué project you have in mind. You will learn the needle turn method as well as other methods to achieve the smooth look of appliqué. You'll learn template making, how and why to use overlays, proper threads, needles, marking tools and much more as well as go home with a folder full of samples for future references. Texas Our Texas BOM series begins Sept 1st. 10-2 for $15. This is a great opportunity to work through this classic Texas pattern with the actual designer. No other store has ALICE for this series! Class will be on 1st Sat. each month. This will be a twelve month commitment You may have a kit for this project lost somewhere with your other UFO’s—pull it out! If not, Quilt Mercantile is working on a background starter kit to help you create your own masterpiece. We give 20% off on the pattern (and all other books & patterns in our store). Finish within three months of the last class—receive 25% off backing fabric. Won’t it be great to come once a month to share food, fellowship, and learn a new technique. This project has a little bit of everything! Sign up now. Limited to 20. Kindergarten Machine Quilting Thurs. June 28th. Do you just make tops? Is the cost of having everything quilted for you stifling your creativity? This class teaches you the basics of machine quilting. Straight line, free form, quilt-in-the-ditch, outline, grid, channel, and stipple quilting will all be covered, plus basting, marking and binding. Come learn how to finish your entire project yourself! Beginning Quilting Fri. June 15th (9:30-4 for $35). This class will take you from cutting to binding in one six-hour class. We will cover rotary cutting, simple piecing, borders, making the sandwich, machine quilting, squaring the quilt, and binding. What’s the catch? The project will be a candle mat or table topper. The only way to experience a “quilt-in-a-day” is to make a very small quilt. I will share a wealth of quilting knowledge and tips with you as you make this small project. This is for students who are truly beginners and need an introduction to our craft. Tell your non-quilting friends so they can become quilters too! Basic Machine Applique Sat. Aug. 18th. Learn the basics for machine applique! You will have the opportunity to use an innovative tool at the shop to die cut your shapes! Or you may choose to trace and cut out your shapes in the time-honored way. Or, you may buy a kit. The skills learned will be bias stems applied with the mock hand applique stitch (a big word for a stitch that looks like you did it by hand), placement on the background, and fusible web sewn down with a blanket stitch, hem stitch, or zig zag stitch. Any simple zig zag sewing machine will work great. I will also demonstrate how to bind a 130 degree angle. Quilt & Connect Machine Quilting class Sat. Aug. 4th. Divide your quilt into small, more workable sections and conquer the problems associated with quilting bulky bed quilts. The sections are lighter, can fit through the opening of your sewing machine, and are easily maneuverable. You will learn four techniques for putting your sections together after they are quilted. Come and learn this common sense approach for finally getting those bed-sized projects finished! The ULTIMATE Sampler! Join the craze known as Dear Jane...recreate this Civil War era quilt with it's small, interesting blocks and triangles, mainly by machine with applique blocks by hand. This class is taught by technique and you are guaranteed to come away learning a shortcut or two and/or new techniques. Let Sarah help you with fabric selection. She will take all the "wonder how she made that one" out of it for you. Dear Jane book required. Class meets May 12th, June 9th, & July 14th from 10-3 and the cost is $10 per class. Marti & Me BOM days Join the current series 10:00-11:30 fourth Saturday each month, unless noted, June 23rd, July 28th, Aug. 25th, Sept 22nd. Join this group to learn how wonderfully a perfectly cut project will sew together. For $5 each month Jo Ann will show a new block and discuss some tricks of the trade. The BOM pattern for Stonehenge meets Jamestown will be worked through. Choose from one of the two styles we have available or use from your stash and buy the pattern! You can cut your blocks in class using the store template sets. Precision engineered corners, permanently marked identification system and cutting by the number are innovations that you will find on From Marti Michell templates. Who better to show you how to work accurately and piece those perfect projects than Jo Ann? FYI: June 23rd class teaches how to use the Log Cabin ruler by Marti. This tool is AWESOME! Slice-n-Sew Snowball Wed. Aug. 15th, 9:30-3 for $30. This stunning project can be made with ease. Let Bettie, the designer of the pattern, assist you in creating this beautiful quilt. Scrappy and fun with a trick for circles, it looks hard but isn’t. This project can have a four patch or nine patch as the alternating block. New sample is hanging in the class room of our store that is BEAUTIFUL! Tie Quilt Wed. June 20th or Sat. June 30th, 9:30-3 for $30. Back by popular demand. This is the class many of you have requested-the sample has been hanging in our class room. This “Stars at Night” quilt has 100 different ties, 185 tie labels. Come and learn the techniques used for making quilts from men’s ties. Bettie is an expert on this process. You will be able to adapt this to any of your favorite patterns. Pattern only available in this class-no extra charge. Plan Ahead: SPECIAL Event. 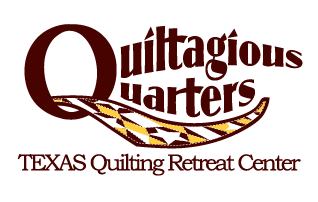 “The” Pearl Pereira of P3 Designs is coming (from California) to Quiltagious Quarters for two retreats in October. She will be available for a one day class teaching her freezer paper starch method October 18th in the Quilt Mercantile classroom (the retreats are already full! ). Sign up quick so you don’t miss her...limited space in class. (QAT) Quilt Across Texas in Sept. 2012!!! 215 US HWY 69 N.